Andrew Dickinson, Marie Hamard, and Wim van der Grijn in Diary of One Who Disappeared. Photo by Richard Termine. BOTTOM LINE: Fans of Ivo van Hove will be happy to see his lesser-known European work on full display. Yes, it’s all here. Ivo van Hove, known on the American stage for both showy new works (Network and Bowie’s Lazarus) and transformational productions of canonical texts (The Crucible, A View from the Bridge, Angels in America) brings his trademark clean simplicity to this early twentieth century Czech opera. If that word conjures up images of gold chandeliers and hats with horns on them, you’re in good company with me. 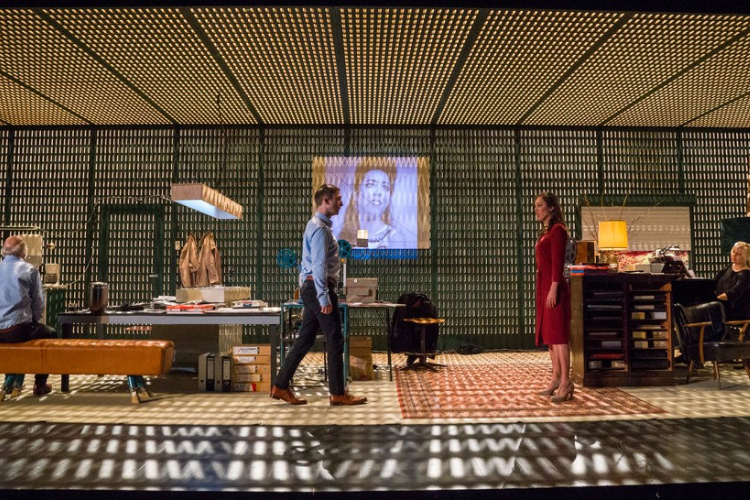 Instead, van Hove plays his opera in a quiet kitchen and living room of a chic albeit cluttered home. Beginning simply with a woman quietly making coffee, finishing with epic despair upon supertitles and in the belted high notes, the contrast is satisfying. The story concerns the obsession for a young gypsy (Marie Hamard) by an older man (Andrew Dickinson.) Curiously, there is much to be sung about her blackness as a gypsy (or Romany, if you prefer.) And if the actress Hamard is (or at least reads as) white, perhaps we should let that one slide and chalk it up to this strange curiosity of European opera? The plot develops further to suggest that this gypsy may now be deceased and the present-day older man (Wim van der Grijn) is putting together the pieces of his obsession with his younger self. I think. But maybe just listen to the pretty music. Van Hove’s world is such a luscious one, with designs crafted by Jan Versweyveld, that I am willing to forgive the shoulder shrugging nature of Diary of One Who Disappeared. The walls are made of a translucent design that seems to heave with golden, passionate light and then pull back in to something much more isolated, cold, and lonely to suggest a cold, Czech winter. Just out the window, a peak of grassy sunshine sometimes glows. Joy perhaps is possible? Your guess is as good as mine. Diary of One Who Disappeared is written by Leoš Janáček. Directed by Ivo van Hove. Dramaturgy by Krystian Lada. Set and Lighting Design by Jan Versweyveld. Music composed by Leoš Janáček and Annelies Van Parys. Costume Design by An D’Huys. The cast is Andrew Dickinson, Marie Hamard, Wim van der Grijn. Additional musicians are Lada Valešová, Naomi Beeldens, Raphaële Green, and Annelies Van Gramberen.